in liver, pancreas and brain. of substrate and not on the demand of the product. of isozymes as molecular markers. to their charge by gel electrophoresis. in the various cells of an organism. gel electrophoresis.” Biochim. Biophys. Acta 284:220-226.
of rat cerebrum.” Mol. Pharmacol.10:615-625. In cells, the immediate energy sources involve glucose oxidation. In anaerobic metabolism, the donor of the phosphate group is adenosine triphosphate (ATP), and the reaction is catalyzed via the hexokinase or glucokinase: Glucose +ATP-Mg²+ = Glucose-6-phosphate (ΔGo = – 3.4 kcal/mol with hexokinase as the co-enzyme for the reaction.). In the following step, the conversion of G-6-phosphate into F-1-6-bisphosphate is mediated by the enzyme phosphofructokinase with the co-factor ATP-Mg²+. This reaction has a large negative free energy difference and is irreversible under normal cellular conditions. In the second step of glycolysis, phosphoenolpyruvic acid in the presence of Mg²+ and K+ is transformed into pyruvic acid. In cancer cells or in the absence of oxygen, the transformation of pyruvic acid into lactic acid alters the process of glycolysis. The energetic sum of anaerobic glycolysis is ΔGo = -34.64 kcal/mol. However a glucose molecule contains 686kcal/mol and, the energy difference (654.51 kcal) allows the potential for un-controlled reactions during carcinogenesis. The transfer of electrons from NADPH in each place of the conserved unit of energy transmits conformational exchanges in the mitochondrial ATPase. The reaction ADP³+ P²¯ + H²–à ATP + H2O is reversible. The terminal oxygen from ADP binds the P2¯ by forming an intermediate pentacovalent complex, resulting in the formation of ATP and H2O. 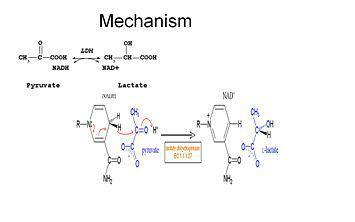 This reaction requires Mg²+ and an ATP-synthetase, which is known as the H+-ATPase or the Fo-F1-ATPase complex. Intracellular calcium induces mitochondrial swelling and aging. . The known marker of monitoring of treatment in cancer diseases, lactate dehydrogenase (LDH) is an enzyme that is localized to the cytosol of human cells and catalyzes the reversible reduction of pyruvate to lactate via using hydrogenated nicotinamide deaminase (NADH) as co-enzyme. The causes of high LDH and high Mg levels in the serum include neoplastic states that promote the high production of intracellular LDH and the increased use of Mg²+ during molecular synthesis in processes pf carcinogenesis (Pyruvate acid>> LDH/NADH >>Lactate acid + NAD), . LDH is released from tissues in patients with physiological or pathological conditions and is present in the serum as a tetramer that is composed of the two monomers LDH-A and LDH-B, which can be combined into 5 isoenzymes: LDH-1 (B4), LDH-2 (B3-A1), LDH-3 (B2-A2), LDH-4 (B1-A3) and LDH-5 (A4). The LDH-A gene is located on chromosome 11, whereas the LDH-B gene is located on chromosome 12. The monomers differ based on their sensitivity to allosteric modulators. They facilitate adaptive metabolism in various tissues. The LDH-4 isoform predominates in the myocardium, is inhibited by pyruvate and is guided by the anaerobic conversion to lactate. Total LDH, which is derived from hemolytic processes, is used as a marker for monitoring the response to chemotherapy in patients with advanced neoplasm with or without metastasis. LDH levels in patients with malignant disease are increased as the result of high levels of the isoenzyme LDH-3 in patients with hematological malignant diseases and of the high level of the isoenzymes LDH-4 and LDH-5, which are increased in patients with other malignant diseases of tissues such as the liver, muscle, lungs, and conjunctive tissues. High concentrations of serum LDH damage the cell membrane [11, 31]. 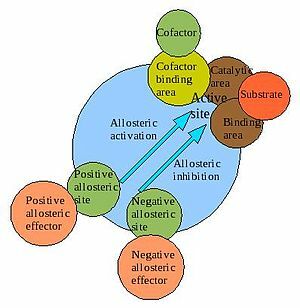 The site the effector binds to is termed the allosteric site. physically distinct from its active site. allosteric transitions:A plausible model. J. Mol. Biol.;12:88-118. in essence, forms a glove around its substrate. enzymes for species-specific drug design and discovery. enzyme, thereby shifting the equilibrium to favor that form (3). and enzyme kinetics: Teaching using morpheeins”. the generation of ATP would slow. allows for the regeneration of NAD+ from NADH. of oxidizing NADH must occur. it can either be converted into lactate or to acetyl-CoA . reaction is catalyzed by the enzyme lactate dehydrogenase. as a self-functioning pathway could not exist. In yeast a slightly different end of glycolysis becomes apparent. environment giving the final product, acetaldehyde. NAD+ and in the process ethanol is formed. There is another advantage to the pyruvate-lactate interchange. reconverted. 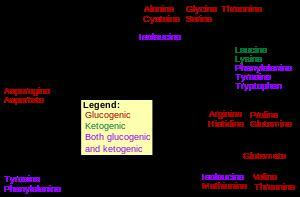 This allows a cell to synthesize glucose from lactate. source of carbons for glucose biosynthesis. hexokinase reaction and the phosphofructokinase-I reaction. NADH, ADP and PO4. NADH oxidation is important in glycolysis. reaction is promoted by O2 ; NAD+ stays in the mitochondria. starvation, low-carbohydrate diets, or intense exercise. and stimulates glucose uptake by cells. gains two electrons (is reduced) and is converted to NADH. unless the coenzyme NAD+ bound to the active site. The liver LDH is composed of predominantly M-type subunits. the circulating lactic acid reaches the liver. be converted to pyruvate and enter into gluconeogenesis. 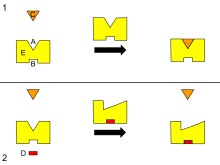 Studies have shown that the reaction mechanism of LDH follows an ordered sequence. 500 msec carried out in the Aminco-Morrow stop flow analyzer. NAD+-lactate is not seen with the M-type LDH. 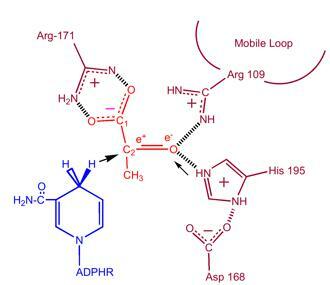 formation of oxidized coenzyme bound with reduced substrate. Genetics and Mutagenesis of Fish 1973, pp 243-276. 3, and 5 (H4, H2M2, M4). cornea were analyzed by starch gel electrophoresis. while in the adult rabbit lens, isozymes 3–5were mainly present. to any major specific lens crystallin. and aerobic tissues mainly LDH-1. the transition from cathodal forms to anodal forms. the replicative activity of these cells. are involved in regulating the synthesis of lactate dehydrogenase subunits. in these works that there is no conceptual foundation. The findings are reproduced in several laboratories. it shows a high rate of arginine incorporationinto protein. Changes in cation levels are apparent. into lens protein is also observed. a-glycerophosphate + DPN+ ± dihydroxyacetone ……..
and the cyclic mechanism is begunover again. lens was proposed by Pirie. concentric layers of adult bovine and calf lenses. Sempol D, Osinaga E, Zigman S, Korc I, Korc B, Sans A, Radi R, et al. Curr Eye Res. 1987 Apr;6(4):555-60.
nuclear layer; the decrease was greater in the adult lenses. percentage of each isoenzyme in the different lens layers. may occur during the aging process. forms of human lactate dehydrogenase. Read JA1, Winter VJ, Eszes CM, Sessions RB, Brady RL. lactate with concomitant interconversion of NADH and NAD(+). of the NADH cofactor and oxamate, a substrate-like inhibitor. are indistinguishable between the two structures. pK(a) of the active-site histidine. a hypothesis supported by electrostatic calculations based on each structure. Mechanistic aspects of biological redox reactions involving NADH. the semiempirical AM 1 and ab initio SCF/3–21 G – methods. and the characteristics of the transition state. from this strain and characterized. HM Wilks, KW Hart, R Feeney, CR Dunn, H Muirhead, WN Chia, et al. Department of Biochemistry, University of Bristol, United Kingdom. highly specific catalyst for the new substrate. which is double that reported for a natural malate from B.
Malate dehydrogenase: distribution, function and properties. Musrati RA1, Kollárová M, Mernik N, Mikulásová D.
Gen Physiol Biophys. 1998 Sep;17; (3):193-210. 3-dimensional structures are very similar. or tetramers with subunit molecular weights of 30-35 kDa. oxaloacetate by cytosolic malate dehydrogenase. converts oxaloacetate to phosphoenol pyruvate. metabolic regulation mechanisms have been discovered. the exact mechanism of regulation has yet to be discovered. like the LDH H-type isozyme LDH-NAD+-PYR (mot the M-type). dehydrogenases–structure and function. Gen Physiol Biophys. ↑Musrati RA, Kollarova M, Mernik N, Mikulasova D.
Kinetic determination of malate dehydrogenase isozymes. Journal of Molecular and Cellular Cardiology (Impact Factor: 5.15). of these isoenzyme forms by high concentrations of oxaloacetate. tissues of the same species. secretion in the absence of any other cytosolic proteins. events that occur in the triggering stage of exocytosis. for their association with CVD, particularly hypertension. a modest change in the resulting gene expression or function. particularly in case of polygenic diseases. GT genotype (21.5%) and homozygous TT genotype (2.7%). that of the north Indian and south Indian population. been associated inconsistently with cardiovascular diseases. predicting blood pressure response to diuretics. inducible isoform of nitric oxide synthase 2.
and its relationship with soluble guanylate cyclase. constrictor effect of norepinephrine and phenylephrine. may help explain sepsis-induced vascular dysfunction. restores the responsiveness to vasoconstrictors. The inhibition be pyruvate is related by a ternary complex formed by NAD+ formed in the catalytic forward reaction Pyruvate + NADH –> Lactate + NAD(+). The reaction can be followed in an Aminco-Morrow stop-flow analyzer and occurs in ~ 500 msec. The reaction does not occur with the muscle type LDH, and it is regulatory in function. I did not know about the role of intracellular Mg(2+) in the catalysis, as my own work was in Nate Kaplan’s lab in 1970-73. This difference in the behavior of the isoenzyme types was considered to be important then in elucidating functional roles, but it was challenged by Vessell earlier. The isoenzymes were first described by Clement Markert at Yale. I think, but don’t know, that the Mg++ would have a role in driving the forward reaction, but I can’t conceptualize how it might have any role in the difference between muscle and heart. I didn’t quite know why oncologists used it specifically. Cancer cells exhibit the reliance on the anaerobic (muscle) type enzyme, which is also typical of liver, but with respect to the adenylate kinases – the liver AK and muscle AK (myokinase) are different. That difference was discovered by Masahiro Chiga, and differences in the reaction with sulfhydryl reagents were identified by Percy Russell. Oddly enough, Vessell had a point. The RBC has the heart type predominance, not the M-type. He thought that it was related to the loss of nuclei from the reticulocyte. I did not buy that, and I had worked on the lens of the eye at the time. Very interesting scientific comments. Thanks. ! IDH1 and IDH2 mutations have been observed in myeloid malignancies, including de novo and secondary AML (15%–30%), and in pre-leukemic clone malignancies, including myelodysplastic syndrome and myeloproliferative neoplasm (85% of the chronic phase and 20% of transformed cases in acute leukemia.